Medical research has proven that diet plays an extremely important role in our overall health. While we are aware of the dietary links to diseases like hypertension, heart disease and diabetes, we often overlook the impact of nutrition on eye health. Age-related eye diseases such as macular degeneration and cataracts are known to cause blindness in older adults. Age-related macular degeneration (AMD) gradually destroys the macula, the area of the eye responsible for providing sharp central vision. It is the leading cause of vision loss in Canada, surpassing glaucoma, retinopathy and cataracts. Though the subject of vision loss can be dispiriting, there is still hope. 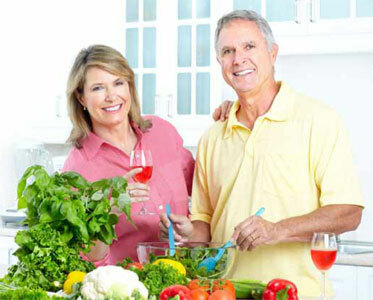 The latest research has shown that a healthy diet and specific high-dose vitamin formulations can help both reduce the risk of developing diseases such as AMD and slow their progression. The National Eye Institute completed the Age-Related Eye Disease Study (AREDS) in 2001. It found that supplementing one’s diet with high levels of specific concentrations of the vitamins C, E, Zinc, Cupric Oxide and beta-carotene (a precursor to vitamin A) decreases the risk of progression of macular degeneration. Lutein and zeaxanthin are two other substances vital to eye health. The Lutein Antioxidant Supplement Trial (LAST) indicated that the nutritional supplementation of lutein together with other nutrients improves visual function. As antioxidants, lutein and zeaxanthin protect against harmful reactive oxygen species (ROS) in the retina, which result from both normal bodily reactions and environmental factors such as pollution and cigarette smoke. Lutein and zeaxanthin also absorb blue light that can cause damage to the retina. In addition to AMD, other diseases of the eye can also be affected by nutrition. Retinitis pigmentosa (RP) constitutes a group of eye diseases that result in slow but progressive vision loss. Patients with RP suffer from a gradual destruction of the light-sensing cells located in the retina. The National Eye Institute conducted a study indicating that patients suffering from the common forms of RP would benefit from a total intake (capsules + diet) of 18,000 international units (IU) of vitamin A daily. It is important to note that vitamin supplements, while helpful, are not meant to replace a healthy, nutrient-rich diet. It is very important that people check with their doctor or pharmacist before beginning any supplement regimen, particularly if they are pregnant, nursing or currently taking other medications. Have them schedule an appointment with you for more information on how vitamins can be used both safely and effectively to improve the health of their eyes.